The team boasts more than 50 years combined of professional, golf and fitness experience. They are experts in their fields, helping thousands of golfers reach their true potential. Nancy Lopez became a member of the LPGA Tour in 1977 and won 48 LPGA Tour events during her LPGA career, including three major championships. She won the New Mexico Women's Amateur at age 12, and the U.S. Girls' Junior in 1972 and 1974, at ages 15 and 17, respectively. Playing in the U.S. Women's Open as an 18-year-old amateur in 1975, she finished tied for second. In 1976, Nancy was named All-American and Female Athlete of the Year for her play at the University of Tulsa. She won the Association of Intercollegiate Athletics for Women (AIAW) National Championship and was a member of the U.S. Curtis Cup and World Amateur teams. She left college after her sophomore year and turned pro in 1977. That year she finished second again in the U.S. Women's Open. In 1978, her first full season on the LPGA Tour, Nancy won nine tournaments, including at one stretch, five tournaments in a row. She appeared on the cover of Sports Illustrated, won the Vare Trophy for lowest scoring average, LPGA Rookie of the Year, LPGA Player of the Year and was named the Associated Press Female Athlete of the Year. She won another eight times in 1979. She won multiple times in each year from 1980 to 1984, although she played only half-seasons in 1983 and 1984 due to the birth of her first child. Playing full-time again in 1985, Nancy posted five wins, five seconds and five thirds, won the money title, the scoring title and the Player of the Year Award. She was also named Associate Press Female Athlete of the Year for a second time. She played only four tournaments in 1986, when her second daughter was born. But came back to win multiple times in 1987-89 - three times each in 1988 and 1989 - and once again won Player of the Year honors in 1988. Her schedule was curtailed again in the early 1990s when her third daughter was born. In 1992 she won twice. She continued to play short schedules - from 11 to 18 tournaments - through 2002. 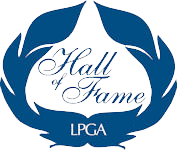 Nancy was inducted into the World Golf Hall of Fame in 1987. She was a member of the United States Solheim Cup team in 1990 and was captain of the team in 2005. She retired from regular tournament play in 2002, and then attempted a return in 2007 and 2008. Nancy is the only woman to win LPGA Rookie of the Year, Player of the Year, and the Vare Trophy in the same season (1978). Her company, Nancy Lopez Golf, makes a full line of women's clubs, clothing and accessories. In 2014, Nancy started Nancy Lopez Golf Adventures to share her love of golf instilled by her father Domingo with golfers of all ages and skill levels. Nancy has three wonderful daughters and a beautiful new granddaughter named Molly. Teresa Zamboni has been a highly respected and recognized member of the LPGA for more than 19 years. Teresa joined the LPGA Teaching & Club Professionals in 1994 and in 2007 she achieved the LPGA's highest honor by being selected LPGA National Teacher of the Year recognizing her as the best teacher in the nation. Most recently, Teresa was named to the Golf Digest 50 Best Women Teachers in America list in 2012 and 2010. Teresa is a certified Titleist Performance Institute (TPI) golf fitness instructor. A passionate tournament player, Teresa has participated in more than 95 LPGA T & CP sanctioned tournaments throughout the United States. She also participated on the Futures Tour from 1998 to 2001. From 2007 to 2014, Teresa was a partner with Ladies Links Fore Golf, LLC. In this role, she was responsible for tournament events, corporate events, online instruction tips and many other aspects of the operation. Currently Teresa teaches at Crane Lakes Golf & Country Club in Port Orange, Florida. Born in Grosse Pointe Farms, Michigan and a graduate of Michigan State University with a Bachelors degree in Telecommunications, Teresa currently resides in Port Orange, Florida. For more information on hosting your own adventure contact Teresa directly by email or 386-451-4808. Sue Powers was named the 2013 LPGA National Teacher of the Year, a highly prestigious honor given annually to the woman golf professional who has most exemplified her profession during the year and is recognized as the best in the nation. Powers enjoyed a successful junior golf career in California and was a founding member of the San Jose State Women's golf team under the direction of LPGA Hall of Famer, Betty Hicks. 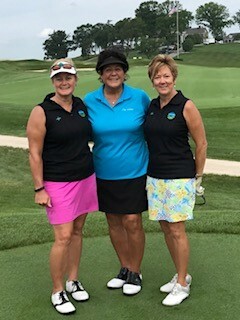 She has been an active member of the LPGA Teaching and Club Professionals since 2004 and has held the officer positions of Southeast Section Secretary and Southeast Section President. From 2008 to 2014, Sue was a partner with Ladies Links Fore Golf, LLC. In this role, she was responsible for overseeing the financial operation of the company. Before entering the golf profession, Powers held several leadership and financial positions within the manufacturing industry, giving her over twenty-five years of business and communication exposure with all levels of management. Sue is employed as the LPGA Class A Teaching Professional and Financial Controller at Pelican Pointe Golf & Country Club in Venice, Florida. She is also a certified Titleist Performance Institute (TPI) golf fitness instructor and a Frankly Frog Putting instructor. Sue uses her teaching knowledge effectively as a Golf Coach for Special Olympics, giving children and adults with intellectual disabilities a continuing opportunity to develop physical fitness, embrace challenges and learn daily life lessons through the joy of golf and friendship. Born in Woodsfield, Ohio and a graduate of California State University with a Bachelors degree in Accounting, Sue currently resides in Venice, Florida. You may contact Sue directly by email or 941-735-5103.